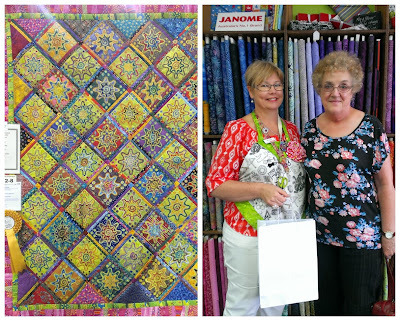 The 2013 Queensland Quilt Show was held in October and Kimz was a proud sponsor. Our prize went to the third place winner of Category 1: Amateur - Appliqued. And the winner is.............Claire Maclaine with her entry "Seeing Stars". We loved meeting and congratulating Claire in our shop on the Sunshine Coast where she selected some goodies to take home with her.